Let's face it. The last thing you want to do on a beautiful Saturday afternoon is clean and organize your garage. If you're like most people, you probably put this tedious task off as long as possible, if you even do it at all. It just sits there on your to-do list while the clutter continues to pile up in your garage. Before long, you won't be able to find anything you need, let alone park your car or work in your garage. But garage organization doesn't have to be stressful or overly taxing. Here are six garage organization ideas to help make the process simple and efficient so you can finally mark "organize garage" off your list of weekend chores. #1: Take everything out of your garage. First, take everything out of your garage. Depending on how much stuff you've accumulated, you may need to plan for this to be an all-day job. But getting everything out is the the best way to assess what you have and start the organization process. Doing the job a little at time will make the process longer and more cumbersome. Also, be sure to do this on a sunny day when there's no rain in the weather forecast. Otherwise, you could find yourself scrambling to get your belonging put back inside quickly and haphazardly. #2: Separate the contents of your garage into pile. Make three piles in your driveway or yard before you start to organize. One is for things to keep. These are items you still use and need on a fairly regular basis. Another is for items to donate. For example, it's probably time to donate a toddler bed that's been collecting dust in your garage for years. The third pile is for trash which includes items that no long operate or have outlived their useful lives. Remember: don't take the items marked for donation back into the garage. If you can't transport them to a donation center on the day of your big clean out, many non-profit organizations offer curb-side pickup of donated goods. You usually must call to arrange the service. #3: Enlist your family members to help you sort all the "stuff"
Chances are good the garage clutter belongs to all members of your family, not just mom or dad. Make certain you get your spouse, kids and whoever else lives in your household to help sort and decide what to keep. Not only will this make the task go more quickly, but it will prevent other people's items from being accidentally tossed out. You don't normally have everything out of your garage so take the opportunity to deep clean. 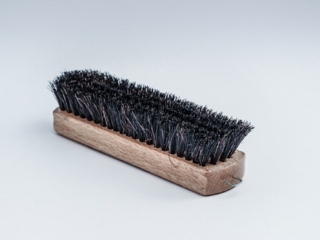 Scrub the floors, wipe down walls and shelves and remove cobwebs from the corners. 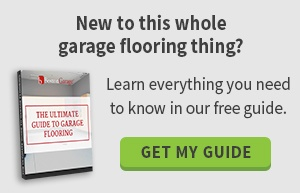 If you really want to make your garage floor shine, enlist the help of a professional to add an epoxy floor coating. An epoxy floor coating provides a very hard, very durable, very shiny surface for your garage floor. It protects the concrete under flooring from stains, spills and damage while making your garage look polished and clean. They're easy to care for and last for years. Epoxy floor coating are available in a variety of colors and patterns so you can match your personal preference and style. #5: Decide what storage systems you'll need and install. While everything is out of your garage, consider installing storage systems to help you keep your space neat and tidy. Shelving, hook systems and overhead storage can really help your organize all the items in your garage while freeing up valuable floor space. For example, hang bikes and kids' ride-on toys on a wall-mounted hook system. Store your winter sports gear on overhead shelves. In the winter, replace the items with the beach chairs, coolers and other items you only get out when the weather is warm. Shelves and cabinets can be used to store many items, including tools, auto care equipment, gardening supplies and other items you normally store in a garage. #6: If the job is too big for you, call a professional for a design consultation -- they'll know exactly which organization systems are right for you. 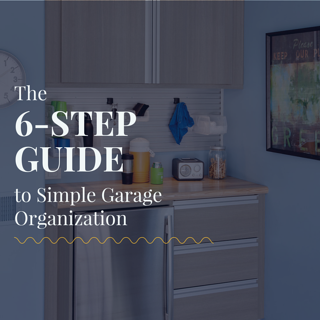 Even with the multitude of garage organization ideas available today, you may be a bit overwhelmed with the idea of finding a place for everything. Trying to find the right way to organize your stuff can be a monumental challenge. So consult a professional garage design company like Boston Garage. We have years of experience helping homeowners find the perfect garage storage solutions. Boston Garage offers complimentary in-home consultations for all your garage storage needs. We'll recommend a storage solution, and our experienced technicians will efficiently install your new custom shelving, hook systems or overhead storage at a time that's convenient for you. All you have to do is place your items and gear in the proper places. You'll not only love how your new garage space looks but also how it functions. To learn more, contact Boston Garage today at 781-836-5145 or use our convenient online form to request a consultation and quote. We'd love to help you identify more garage organization ideas that will make your life less cluttered and more efficient.